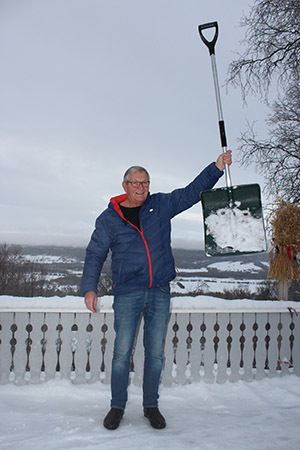 STRONG: After three years with an almost destroyed left shoulder, Tore Kristoffersen (71) from Røros can lift the arm without pain. The turning point occurred when he phoned Svein-Magne Pedersen in December in 2017 and received prayer. For three years, Tore Kristoffersen (71) had a shoulder that was dysfunctional, and six doctors had given up on him. The left arm was almost lame. Also, he had a fracture in the back and pain in one hip. In December 2017 he called the prayer phone, and God gave him a Christmas present in advance. -Welcome to Røros, says Tore Kristoffersen when we arrive at the house in Bersvendsåsen with views over parts of the mountainous town of Røros. White-clad mountains and valleys meet us. The temperature only displays 2 minus degrees Celsius, in the village known for its cold winter weather. -The official record is minus 50.4 degrees, but it has been measured colder. Where I live it was 48 minus degrees a few years back, says Tore. Currently it is December and a Christmas atmosphere in Røros. Tore Kristoffersen is delighted to have received a great Christmas present in advance this year. -I have recovered. A few weeks ago I used crutches and had many ailments, but now I'm healthy, he says happily. That's why the magazine Healing has traveled over 700 kilometers from Vennesla to hear the great testimony of the 71-year-old who has both been a chef, a merchant and former chairman of a political party in the municipality. Tore’s story started at Easter in 2014 when he was on a skiing trip with his grandchildren. During the journey, he wanted to impress with his skiing abilities, and took off at high speed. -Suddenly the snow stopped. I met a gravel road and fell forward. I ruined both my shoulder, back and left hip. Fortunately, a snowmobile was driving by, and Tore was then taken to emergency, and later he was transported by car to Tynset Hospital. The x-rays showed that the shoulder was broken and out of line, and it was so complicated that the doctors did not know what to do. They spent nine whole hours trying to put it in place. I had severe pain and used morphine, but when they pulled my shoulder into place, I fainted from the shock, he says. The doctors said that there was little that could be done with the shoulder. The only advice was to try to train it, but it didn’t help much. A total of six different doctors said that there was no possibility that the arm would function again. -The arm was almost useless. I could only lift it up to my stomach and therefore had to have help with more things like putting on a jacket. When I put on my pants, I had to sit on my knees. It was also painful to lie on the left side in bed. At the time, I worked traveling around and demonstrated goods for various stores in the southern and eastern parts of Norway. I had to stop this now. In addition to the destroyed shoulder, Tore also had two fractures in the back. He also had a fracture from an earlier accident, and with three fractures, his body did not get any better. His back was painful and stiff, and he could not bend too much. The skiing accident also led to fractures on Tore's pelvis. -The pain was excruciating and after three years of ailments, I eventually had to have an operation in November in 2017. After the surgery I had to walk with crutches that I then replaced with walking sticks. Tore Kristoffersen had previously been in touch with Svein-Magne Pedersen and been healed (see further in the article). Now he considered contacting him again. -It's terrible that one has to call and beg for help again, he said to his wife, but she definitely thought that he should call Pedersen again. When Pedersen prayed for him (December 1, 2017), he felt a tingling in his body. An hour later Svein-Magne Pedersen was finished at work. He was in a store in Vennesla to shop with his wife when his cell phone rang. At the other end, there was a happy and joyful man from Røros. -It is fantastic! Now I can swing my arm around like a Ferris wheel. It works perfectly without any ailments. In addition, my back and hip have become restored, shouted a happy and healed Tore. Many are surprised when they see Tore walk normally and with an arm that works. Some have even wanted to contact Svein-Magne Pedersen for their own ailments. Many acquaintances in the town have heard Tore's story. They cannot deny the miracle because they can see what has taken place. -In the time that followed, I have not used the crutches, and my back is healthy. Now I'm self-reliant and do not depend on my wife anymore. I'm shoveling snow without problem, but my wife has nevertheless given me a ban on skiing, he says and laughs. I am so grateful for Svein-Magne Pedersen's prayers. He has contact with God. Tore Kristoffersen has previously experienced healing. In 1989 he was so unfortunate to have a 200-kilo roof fall on his head, which was the start of many years of pain and problems. -I could hardly turn my neck. A neurologist confirmed a fracture in the back and whiplash. For 13 years I walked around with pain twenty-four hours a day, and I never slept a whole night without waking up. For someone who had never been a day absent from work, this was a difficult situation. Ultimately, he had to give up the business. -I had so many injuries that had I been a domestic animal, I would have been put down a long time ago, Tore says humorously. In 2002, Svein-Magne Pedersen participated in a debate program on TV 2. Pedersen said that people could lay hands on the television when he prayed. -I did not know about Pedersen at the time but figured I should try this. Had my wife been home, I would have never dared to do that, Tore said. That night he slept uninterrupted all the way to the morning. As he woke up, the pain was gone and he could turn his head in all directions. Tore then went to the doctor who was very surprised. -There is much between heaven and earth that we do not understand. What this is, I do not understand. -My chiropractor has x-rays from before and after this happened, so the miracle can also be documented. In October 2005, Tore was a guest in the same debate program on TV 2, where Svein-Magne also participated. There Tore testified about his miracle to the entire population of Norway. -Now I have even more healings to tell of. I can not deny that it's true. Thank you to Svein-Magne Pedersen for all your prayers.